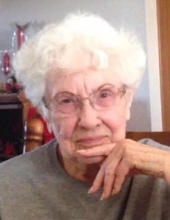 Dorothy Mae DeCoursey, age 91, of Mt. Vernon, Missouri, passed away at 3:38 a.m. on Friday, February 8, 2019, at the Mt. Vernon Place Care Center. She was born July 7, 1927, in Camdenton, Missouri, the daughter of Robert and Florence (Bookhout) Keeney. Dorothy was a 1946 graduate of Camdenton High School in Camdenton, Missouri and was a homemaker. On May 17, 1947, she married William Malcolm DeCoursey, in Camdenton. He preceded her in death in February of 1963. Dorothy is survived by her daughter, Scherice Flanigan and her husband, James, of Mt. Vernon; one son, Gary DeCoursey and his wife, Arlene, of Graham, Washington; seven grandchildren, 13 great-grandchildren and one great-great granddaughter. Dorothy was preceded in death by her parents, Robert and Florence, husband, Malcolm, daughter, Tambra Wilson and her husband, John and seven brothers and two sisters. A graveside service, under the direction of the Fossett-Mosher Funeral Home, in Mt. Vernon will be held at 2:00 p.m. on Tuesday, February 12, 2019, at the Myetta Cemetery in Camdenton, Missouri. To plant a tree in memory of Dorothy Mae DeCoursey, please visit our Tribute Store. "Email Address" would like to share the life celebration of Dorothy Mae DeCoursey. Click on the "link" to go to share a favorite memory or leave a condolence message for the family.